Tony Michels. A Fire in Their Hearts: Yiddish Socialists in New York. Harvard University Press, 2005. In a compelling history of the Jewish community in New York during four decades of mass immigration, Tony Michels examines the defining role of the Yiddish socialist movement in the American Jewish experience. The movement, founded in the 1880s, was dominated by Russian-speaking intellectuals, including Abraham Cahan, Mikhail Zametkin, and Chaim Zhitlovsky. 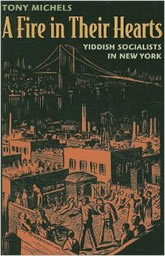 Socialist leaders quickly found Yiddish essential to convey their message to the Jewish immigrant community, and they developed a remarkable public culture through lectures and social events, workers’ education societies, Yiddish schools, and a press that found its strongest voice in the mass-circulation newspaper Forverts. Arguing against the view that socialism and Yiddish culture arrived as Old World holdovers, Michels demonstrates that they arose in New York in response to local conditions and thrived not despite Americanization, but because of it. And the influence of the movement swirled far beyond the Lower East Side, to a transnational culture in which individuals, ideas, and institutions crossed the Atlantic. New York Jews, in the beginning, exported Yiddish socialism to Russia, not the other way around. The Yiddish socialist movement shaped Jewish communities across the United States well into the twentieth century and left an important political legacy that extends to the rise of neoconservatism. A story of hopeful successes and bitter disappointments, A Fire in Their Hearts brings to vivid life this formative period for American Jews and the American left.